Cisco Express forwarding (CEF) has been boon in today’s IT world of where every product and service has moved towards network of networks i.e. Internet. Handling problems associated with high demand on IT infrastructure, CEF has rightfully stood up and addressed demand caching to handle huge influx of traffic. 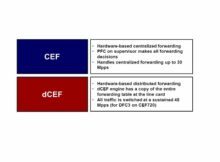 Developers of CEF have been evolving new features time to time to give CEF the edge and become indispensable part of IT Networking. 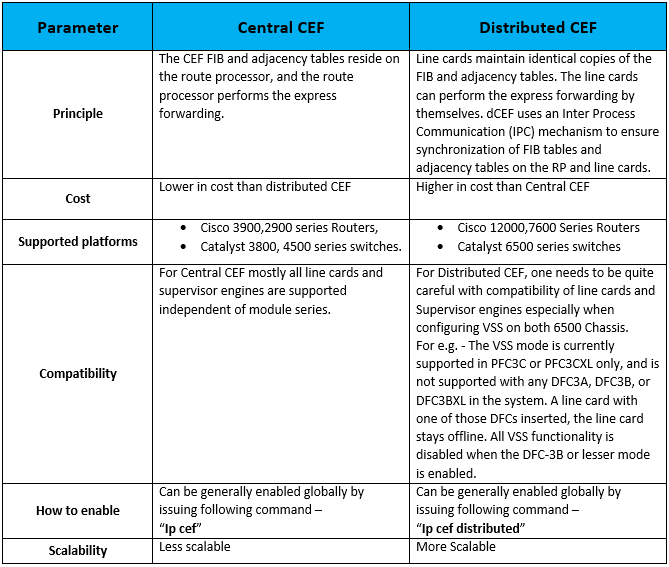 Central CEF and Distributed CEF are 2 flavors of CEF with former holding FIB and adjacency tables on the route processor while latter enabling line cards to maintain FIB and adjacency tables locally.